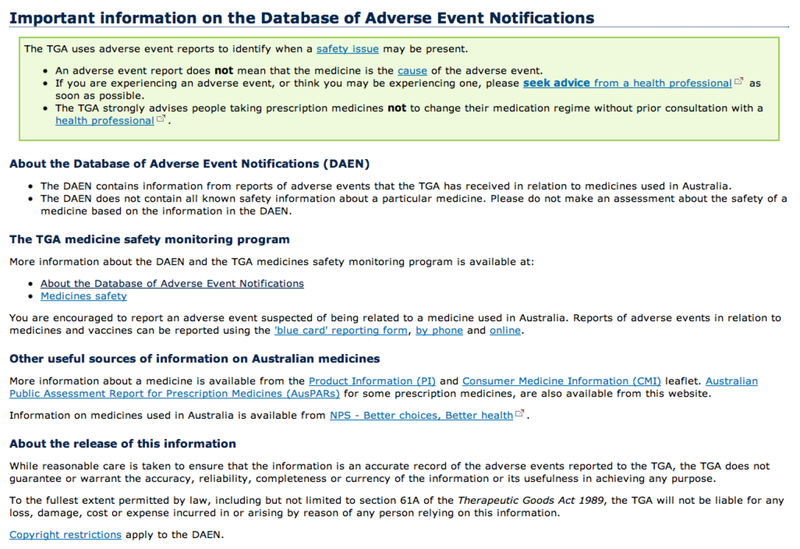 To date, Australia’s database of adverse event notifications has recorded over 1991 suspected side effects following the cervical cancer vaccination. Sounds like you're part of the anti-vaccination network. Letting people die of preventable diseases due to grossly exaggerated risks. "The list of adverse effects following Gardasil is extensive with many of the side effects serious and long-lasting. They include...."
And how does the incidence rate of these conditions in people injected with Gardasil compare with the rate in those not injected? Because that's the real issue, isn't it? But by the way in which it's been carefully omitted from this article, I think I can guess the answer. oh dear another fringe group shouting at the moon. Hooray or a chorus of very loud cheering them on duck quacks for Renate and Helen. Even a cursory Google search on the topic can provide support for their claims and cautions. Try Mercola and Gardasil for starters beginning with the Lew Rockwell item. Of course some people will dismiss Mercola as a quack, but they are just promoting their own closed-minded prejudices. To me his informative newsletter provides a necessary questioning of how Big Pharma promotes and controls what is acceptable within the mega-billion bucks (to me made) USA sickness industry, and the way in which it promotes its hucksterism all over the world, including here in the land of Oz. "In the U.S. the total number of adverse effects stands now at 30,000, with 138 deaths 5977 girls and young women whose health never recovered. Due to the lack of mandatory reporting, only between 1 per cent and 10 per cent of adverse reactions are ever recorded, so unfortunately we are really looking at much higher figures." This anti-vaccine sleight of hand is becomming very tiresome. The authors' "30,000" is from raw, unverified figures that have not been subject to any follow up methodology to correct for other variables or to seek to recreate the subjective claim in strict conditions. The figure of 30,000 is from the same pool of VAERS self-reporting that accepted reports of patients turning into The Incredible Hulk and Wonder Woman. These two comical reports purposely intended to expose the unreliable bias of VAERS to which I'm alluding. So what of the 1 - 10% under-reporting figure? The reality (unsurprisingly) is that health authorities need to know of every type of adverse reaction - no matter how seemingly insignificant. This improves the quality as well as quantity of known reactions. In fact the bulk of reactions constitute redness, temporary swelling, warmth, itching, soreness, a small lump at the injection site or other minor, temporary irritation. Across the range of available vaccines, adverse reactions vary notably. Depending on the antigen, patients may experience raised temperature, nausea, dizziness, fatigue or other transient symptoms. In the case of the influenza vaccine, the recipient may experience short term 'flu-like symptoms as the vaccine successfully stimulates the immune system. The reason these are under-reported is that they are very minor in nature or duration. Parents or patients may rarely give them much thought, and even less so, follow through with reporting as an Adverse Reaction. Tendency to report symptoms from adverse reaction is positively correlated to duration. Thus for health authorities, the problem is the trivial nature of the reaction precipitating a reluctance in patients to revisit/contact the vaccine administrator or go to the trouble of making a report. Within a few hours the minor irritation has passed in 90 - 99% of cases. It is this fact that yields the 1 - 10% reporting figure anti-vaccine lobbyists continue to promote. When added to unverified, self reported "reactions" we have a strategy to mislead the public and falsely argue that 90% of serious reactions are not reported. The figures that should be consulted regarding adverse reactions are not raw, self-reported and unconfirmed, but those that emerge from properly designed reviews with robust methodology. Despite citing DAEN, the authors have failed utterly to mention that loading the DAEN web page brings up this warning on causality. The first point is: "An adverse event does *not* mean that the medicine is the cause of the adverse event". "The degree of underreporting varies widely. As an example, a great many of the millions of vaccinations administered each year by injection cause soreness, but relatively few of these episodes lead to a VAERS report. Physicians and patients understand that minor side effects of vaccinations often include this kind of discomfort, as well as low fevers. On the other hand, more serious and unexpected medical events are probably more likely to be reported than minor ones, especially when they occur soon after vaccination, even if they may be coincidental and related to other causes." As noted, the above reinforces that "a great many" vaccinations cause soreness but few lead to a report. Alternatively, serious and unexpected events tend to be reported even when not related to the vaccine. IE; a coincidence. This is the opposite to what the authors are arguing. The rest of the article is peppered with similar deception. But for this well-worn point at least it should be clear how the authors (and many other anti-vaxxers) use DAEN and VAERS to deceive their readers.